Well what a trip! 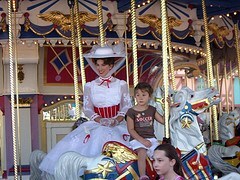 Every time I go to WDW FL there just seems to be more and more to cover! There were 7 of us on this trip, so as you can imagine, it was no always easy doing things that everyone wanted to do. Then someone needs the toilet… someone wants a drink… so although we had a fantasmic trip, I’m not sure I’d go with so many people next time! We stayed off site at the Howard Johnson Maingate West, along the far west end of SR 192. 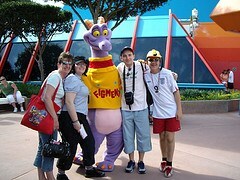 It was the first time we had stayed in Kissimmee, and to be honest the last! We love Lake Buena Vista, and that’s where I will return to next time. Anyway, that aside, it was only 10-15mins from all the Disney parks and 15-20mins to Universal and SeaWorld which was nice and easy. There was a Chinese Buffet next door which was nice and clean and friendly. Good food and good prices. Walgreens was just down the road and Wal-Mart Supercenter just along the road on the SR 27. 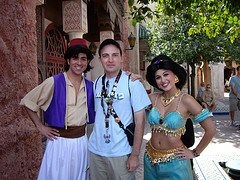 Our first day in Disney this trip was Tuesday 24th October in Disney’s Animal Kingdom. Expedition Everest really is the most awesome ride Disney have ever conceived! The whole area surrounding it is stunning, the landscaping and the theme beautiful. They really have it so spot on. The actual queue line is quite interesting and gives some good views of the mountain. When you first get on the ride train and it sets off, you think ‘oh this isn’t so bad – it’s like Thunder Mountain’…. Then you are taken up… and up… and you meet a dead end… then it’s backwards at 60mph in the pitch dark… you see a shadow of the yeti and then it’s off to meet him! And boy is he real!! The drop is about 80ft and is thrilling and the ride photos at the end are good fun. There is a lot of cool merchandise at the ride exit gift shop too. On our second day (Wednesday 25th October) we visited the Magic Kingdom. Magic Kingdom still remains my top favourite and it sure did not disappoint! We took the monorail to get to the park and the ferryboat back. We also ate in Cosmic Ray’s Starlight Café. When we arrived at the park today there was a massive black crane hanging over it which was based in Fantasyland. It kind of spoiled the effect and our pictures, but at about midday the crane was lowered and picture opportunities once again become available. 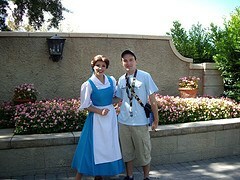 We met a lot of characters today and they really seemed to be out in full force. The Pirates of the Caribbean is really no better than it was before, with the exception of the Jack Sparrow animatronic figure at the end. The two during the ride and the Barbossa don’t do a lot for me. The hologram of Davy Jones at the start of the ride though is quite a cool effect. But personally, the PotC ride at Disneyland Paris is still the superior one! Sorry guys! On the 26th October we made our first visit to EPCOT of the trip. 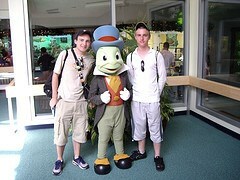 We spent the whole time there in Future World because there was so much to see and do! We also ate in the Electric Umbrella. I think the Land Pavilion is probably about the best in Future World. Test Track is still pretty cool, though didn’t seem as thrilling as before. I also rode Green Team on Mission Space. I rode the original when it first opened in 2003 and refused to go on last year because it made feel so rough! But now they have changed it, it is pretty cool. Love the theme and the design of it. It’s a shame though really because it is an amazing experience but there seemed to be little interest in it. I think they over did it and the world got round about how menacing it was – now they have killed it. All that money and effort; and they went too over the top – now no-one wants to ride. A real shame. This evening we went to the Magic Kingdom for the Mickey’s Not-So-Scary Halloween Party. We arrived about an hour or so early and as we entered we were given trick or treat bags and a wrist band to wear. We also received our Halloween Guide Maps and we were set to go! The park had already been decorated out for the event and the night was drawing closer. As night fell and the people thinned out, the Halloween music began to play around the park and the lighting changed. There was that fake smoke stuff all over the place kind of lingering about the pathways, making it look spooky, characters were out around the park in Halloween costumes, decorations and spooky projections donned the buildings and pathways. It was really cool. On top of the Tomorrowland buildings there were a giant Stitch and a giant spider. In Adventureland there were a giant Timon and Pumba. The trick or treat locations were cool and we picked up lots of candy. The Halloween parade was excellent. The floats were all different and unique just for the event. The Headless Horseman made an appearance at the start too and really set the creepy scene! At the end of the parade they gave out candy too! The HalloWishes fireworks were spectacular. For the first time in my travels to Disney I saw giant Catherine wheels on the side of the Castle! I was like ‘oh my god! They have fireworks actually on the Castle!’ That was pretty cool. The soundtrack to the fireworks was good too (“boo to you…” lol) Also for the first time, the fireworks were somehow sent up and instead of just being behind the Castle or in the skies above it, some of them actually surrounded the skies above the plaza area. They sort of made a giant ring around the hub and lit up the entire park. It was quite spectacular. I have never seen Disney do that before. We also ate in Pecos Bill’s café that evening. 27th October came around and we went to Disney-MGM Studios. We also ate at Rosie’s at lunch time. We visited Downtown Disney in the evening. On the 29th October we visited Downtown Disney again in the evening. On the 1st November we spent the day at Downtown Disney. We visited DisneyQuest. On the 2nd November we spent the day in magic Kingdom again. We ate in the Columbia Harbour House. In the evening the tree was lit up which was nice. On the 4th November we went to EPCOT again. We ate in the Electric Umbrella again! On the 5th November we visited the Animal Kingdom for the last time. As with Magic Kingdom the Christmas decorations were now up all over the park and made a nice end to our trip to see them. On the final day of our trip, 6th November, we visited Downtown Disney for one last time and went in DisneyQuest. For anyone looking for official WDW merchandise at discount/sale prices, then head for the Character Premier store at Premium outlets at the very far end of I-Drive (formerly called Belz Factory Outlets). The store is Disney owned and is manned by Disney CM’s – it’s where WDW sent merchandise from promotions that have ended that they don’t like to mark down in the parks. They do this in fear of spoiling their perfect image. The pins are half price. They sell lanyards and lanyard medals at half price. They are all fantastic too. I picked up some amazing bargains. They have t-shirts, ornaments – everything really! It’s a cool shop and well worth a visit. I picked up a Halloween Lilo mini beanbag, previously $11.00 – marked down to .99c!! Yes! .99c! Just because it was an old Halloween line of plush! The food and wine festival at EPCOT is a waste of time. It just crowds up the narrow pathways between the showcases and is an excuse for fat Americans to eat cheap to their hearts content in my opinion! The new ‘Year of a Million Dreams’ decorations and advertising around WDW make it a bit like Universal - cheap and tacky with only one focus - advertising. They should stop this promotion NOW!